The mid-range SP-A600B DLP projector is Samsung's first stab at the sector and it's a generally impressive attempt if you can find it on sale at a decent price. Its appeal begins with its gloss black and unusually shapely appearance. The SP-A600B sports Samsung's signature blue LED lights above the lens and a sleek design. You can place it in full view on a coffee table for high brightness content such as live TV or sports, despite its low sounding 1,000 ANSI Lumens brightness. It's well connected, too. All the usual in and outputs are present, with a second HDMI input as an added bonus. A slight cause for concern may be the low contrast ratio of 3,000:1. That's nothing compared to some projectors, but its inclusion of Texas Instruments' DLP technology makes this less of a cause for concern since DLP models rarely offer less than excellent black levels. Although the SP-A600B can display Blu-ray spun at 24fps, it lacks any kind of film mode. Greyed-out on the onscreen menus, this kind of frame insertion mode usually brings an extra dollop of fluidity to movies, though it can introduce artefacts. Also lacking is a lens shift mechanism that would enable off-centre placement of the unit; the basic keystone correction system isn't as useful. Despite these limitations, the lightbox will be an attractive proposition if it can emulate the good work of its more costly DLP sibling, the SP-A800B. The basic spec of the SP-A600B does, at least, make it a very user-friendly product. The tiny remote control, while nicely weighted, well made and very simple to use, desperately needs a backlight for use in darkened viewing conditions and more bulk to keep it from disappearing down the sofa, never to be seen again. It hosts dedicated buttons for each video input, a toggler for picture presets, and the keystone controls. Although it's not as flexible as we would like, the SP-A600B's vertical onscreen menus do mean that the picture can be set to your exact requirements. And that's important, because to achieve near-perfect colour it's worth increasing the brightness slightly, and making sure that the gamma setting is on 'film' rather than 'video'. Once you've made a few tweaks, there are three user modes you can save your settings to, though if you'd rather rely on presets, the movie modes are decent enough. Although it's capable of projecting some material in low light, the SP-A600B isn't the quietest projector out there. 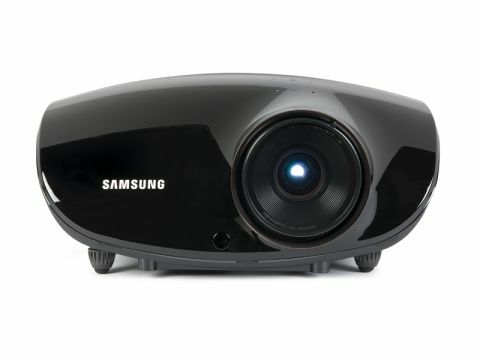 Projectors have generally become quieter recently, but this is one feature Samsung has sacrificed at the altar of design; near-silent projectors tend to be a lot bigger than this one. The SP-A600B excels with blacks and Samsung's faith in DLP is rewarded with some Blu-ray pictures that swim in realism. Used in a blackout the beamer can reproduce detail-rich, inky blacks. The final scenes of our test disc, Transsiberian, set in a disused warehouse, are rendered well with dark and shadowed areas hosting visible details, lending the scenes plenty of depth. Thanks to its endlessly tweakable picture parameters, it's also possible to make the SP-A600B create stunning colours. The wintery scenes look murkier than they should at first, but play around with the colour temperatures and stunning accuracy can be easily achieved. Although there's little sign of smearing during fast motion scenes, such as the chase sequence on the train, we did notice some judder during some camera pans. This is where the SP-A600B could benefit from the kind of frame insertion technology that's become increasingly popular even at this budget level. If you're sensitive to the rainbow effect, you may have a problem with this projector, but it's not a deal breaker; we noticed it, but not often. Attached to a Virgin Media V+ box, the SP-A600B applies its detail and healthy black levels to footage from The Proms. It's possible to discern detail on each of the musicians' black suits, to the extent that the image gains depth, although this 1080i broadcast from BBC HD does show up some picture noise in the Albert Hall's less detailed, darker upper echelons. The skin tones of the players in the orchestra can appear a little exaggerated if you rely on the fixed preset modes. Back on Blu-ray, a slow-motion sequence from Life shows a Greater Bulldog bat glide down to a river at night; the SP-A600B displays tiny veins on its dark, translucent wings and as he snags a fish, water droplets spray up, each one reflecting moonlight. It's stunning, and the SP-A600B helps greatly by keeping the background jet black. We spotted the SP-A600B online for £999, which makes more sense, given its limited flexibility and mediocre haul of features. If you fiddle with the machine's colour temperatures you are rewarded with superb colour to match its super fine detail. Hard to resist.